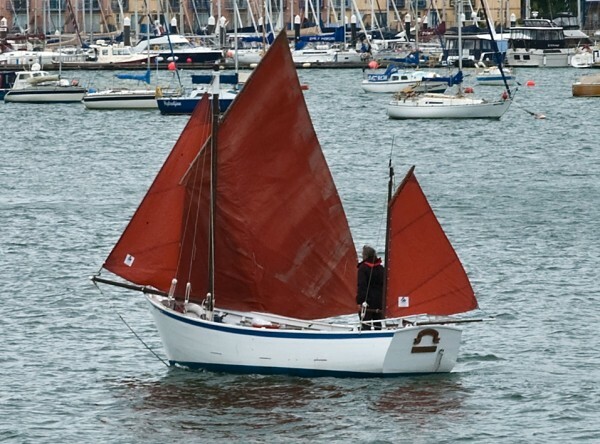 Breton crabbing lugger built to the traditional design in 1980 for an English gentleman. Typical Breton lines, built by Monsieur Marcel Heltergouarch of Concarneau. Used around the south coast of the UK as a private pleasure boat and more recently the boat has been used to fish in the traditional way with outrigger poles. Major refit completed in 2010 with photos and survey available. Open decked launch type boat with transom stern and raked stem. Water tight deck with high bulwark all round and a decent amount of freeboard making her seaworthy and suitable for commercial coding. The boat has considerable beam for her length and a sharp turn to the bilge midships giving her the enormous amount of inherent stability that was required from these tough little working boats. Planked in 7/8” mahogany, fastened with galvanised boat nails to heavy 2”x 1.5” sawn French oak frames at 14” centres. Some areas of decayed planking replaced 2014. Hood ends fore and aft fastened with 316 stainless steel screws. Full length oak keel with oak floors. Marine plywood deck, sheathed in epoxy glass and finished in grey non-slip deck paint. Painted Iroko cover boards up to the ply deck. Two water tight hatches in the deck give access to the engine and the forward bilge, used as a storage locker. Watertight bulkhead between the forward storage space and aft engine space. New solar ventilation fans installed 2014. Thwarts across the transom and midships give suitable seating space while leaving the deck open enough to enable to crew to move safely around and work the boat. Tiller steering to a steel plate rudder set under the hull within the length of the boat. Two masted lug rig with bumpkin and bowsprit. Main mast set in a galvanised tabernacle bolted to the deck forward of the hatch allows it to be dropped by one person. Main mast replaced in 2001. Mizzen set off to port just forward of the aft thwart. Bowsprit sets through a gammon iron on port side of the stem and can be easily run in for mooring purposes. Stainless steel standing rigging with seized eye terminations to deadeyes and lanyards. External galvanised steel chainplates. Main mast with twin shrouds and forestay. Mizzen mast with single shrouds. Beta Marine 2cyl 16Hp diesel engine installed new in 2010. Less than 50 hours. New Iroko engine beds installed at the same time. Single lever controls at the aft end on starboard side. Beta gearbox with stainless steel shaft to 3 blade bronze propeller gives 6 knots cruising speed. New propeller and shaft in 2010. Fuel tank located under the deck. 60L plastic tank with CAV filter and water separator. Engine first commissioned in 2011 and serviced regularly. Single 12 volt battery for engine starting and domestics. Charged from standard Beta alternator. Small waterproof switch panel located next to the engine controls.